From Truffaut’s Day for Night to Burton’s Ed Wood and countless others, films frequently take the setting of filmmaking as their playground. For horror, the meta-possibilities seem endless. What if a serial killer hired a documentary crew to capture him as he lived the tropes of the slasher? I give you Behind the Mask: The Rise of Leslie Vernon. Or what if a horror veteran reinvigorated a dying genre by creating a horror film where life imitated art – a serial killer struck a small town using all the slasher cliches in his arsenal – just as a horror film was being released about that town? Oh Wes Craven, you genius. The options are numerous, but today we focus on those films that use filmmaking as a backdrop to explore both horror and filmmaking, all the while entertaining and horrifying us all. Mild mannered – even for a Brit – sound engineer Gilderoy (Toby Jones – perfect) flies to Italy to do the sound for a documentary about horses. But The Equestrian Vortex is, in fact, a gaillo horror film about torturing women – not that director Santini (Antonio Mancino) will admit that. Gilderoy is bullied and misued, returning to his quiet room at night to miss his mum and work on some sound effects. As the harassment in the studio spills beyond his own bullying to something more sinister with one of the female voiceover talent, and the sounds and images he’s forced to work with become more and more brutal, Gilderoy begins to see the world differently. This is a surreal look into the splintered imagination of a delicate man pushed into something ugly. It’s also a very slow but effective, absorbing meditation on horror. Adam Brooks plays Rey Cisco, the editor of gaillo films who finds himself at the center of a murder mystery resembling the very films he helps to create. Adam Brooks is also the editor of the film The Editor, a gaillo film about an editor caught inside a gaillo-film-like mystery. If you do not know Italian horror well, this may feel like a slapstick piece of nonsense. But if you do know this very nichy genre, man, do Brooks and his co-writer/director Matthew Kennedy know what they are doing. The reason the send up is so funny is not just because it’s very loving, but because an unreasonably popular line of films behaves exactly like this one. It’s just that this one knows it’s funny. 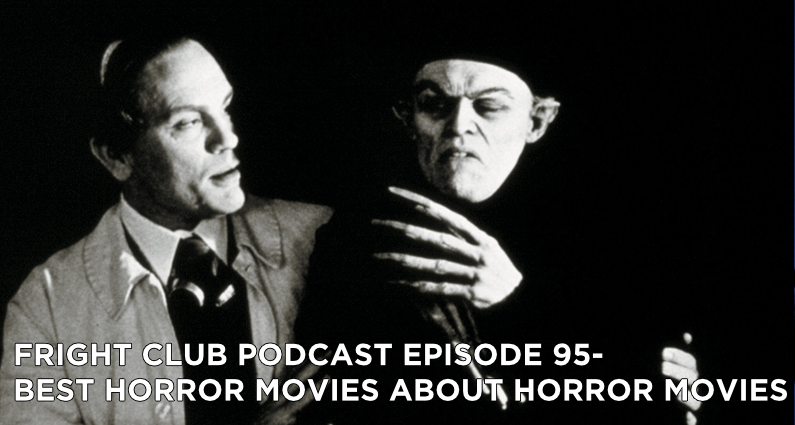 E. Elias Merhige revisits F. W. Murnau’s masterpiece Nosferatu with smashing results in Shadow of the Vampire. Wickedly funny and just a little catty, ‘Shadow’ entertains with every frame. This is the fictional tale of the filming of Nosferatu. Egomaniacal artists and vain actors come together to create Murnau’s groundbreaking achievement in nightmarish authenticity. As they make the movie, they discover the obvious: the actor playing Count Orlok, Max Schreck is, in fact, a vampire. The film is ingenious in the way it’s developed: murder among a pack of paranoid, insecure backstabbers; the mad artistic genius Murnau directing all the while. And it would have been only clever were it not for Willem Dafoe’s perversely brilliant performance as Schreck. There is a goofiness about his Schreck that gives the otherwise deeply horrible character an oddly endearing quality. Eddie Izzard doesn’t get the credit he deserves, reenacting the wildly upbeat performance of Gustav von Wagenheim so well. The always welcome weirdness of Udo Kier balances the egomaniacal zeal John Malkovich brings to the Murnau character, and together they tease both the idea of method acting and the dangerous choice of completely trusting a director. In another bit of meta-filmmaking, Man Bites Dog is a pseudo-documentary made on a shoestring budget by struggling, young filmmakers. It is about a documentary being made on a shoestring budget by struggling, young filmmakers. The subject of the fictional documentary is the charismatic Ben – serial killer, narcissist, poet, racist, architecture enthusiast, misogynist, bird lover. Benoit Poelvoorde’s (who also co-directs) performance as Ben is just as quirky, ridiculous and self-centered as it can be. He’s perfect. His character needs to move the group toward fear, camaraderie, and sometimes even pity – but slyly, he also moves the audience. The film examines social responsibility as much as it does journalistic objectivity, and what Man Bites Dog has to say about both is biting.